You may have a deadbolt lock on your front door and may never give it a second thought; if you realize how this lock works and why it's so important when it comes to your security, you may realize why it's good to consider a deadbolt lock in other areas of your home as well. Good security systems require strong locks. Take a look at your doorknob and note what keeps the door in place when it's closed and locked. You have a very small part that slides into an opening in the wall, and a few hinges keeping the door in place. It's plain to see why this is a poor way of securing your property; a good swift kick can break open this type of door rather easily. A deadbolt lock is a thick metal bolt that slides across the opening of the doorway and rests inside another piece that is screwed into the wall. This thick bolt is very difficult to break, and the large pieces of the deadbolt lock make it difficult to kick in. 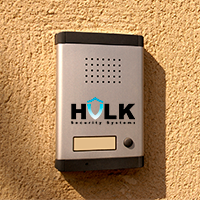 Hulk Security Systems provides a variety of deadbolt and other locks for security systems. Keeping your home secure is important and you want only the best quality service that you can find in New York. We can provide excellent deadbolt locks and more advanced lock systems for homes and businesses alike. It is likely that you will need several locks for the best security and our expert technicians will provide you with the best advice for added protection. NYC security systems are especially important in high crime areas. A good deadbolt lock can keep you more secure in your home and is a good idea for businesses as well. You can find larger models that are perfect for commercial grade rolling doors, and those that work well for outbuildings such as sheds and garages. In some cases you may even want to get more than one deadbolt lock installed on a door for added protection, such as in high crime areas.